Carbohydrates are polyhydroxy aldehydes or ketones. Carbohydrates are sugars and their polymers. They are composed of carbon, hydrogen and oxygen. The word carbohydrates literally mean hydrated carbons. The ratio of hydrogen and oxygen is the same, as in water, i.e. Their general formula is Co (H20) o. The number of carbons may be from three to many thousands. Sources of, carbohydrates are green plants. Carbohydrates ‘are primary products of photosynthesis. Other compounds of plants are produced from carbohydrates by different chemical changes. They form different structures, like cellulose of wood, cotton, and papers. They are found in all organisms. They are present in all parts of the cells. They act as storage compounds like starch and glycogen. Carbohydrates are also present in cane sugar and milk sugar. They are the main source of energy in cell. Some carbohydrates like cellulose, chitin form cell wall in plants and microorganisms. I. They are sweet in taste. They are easily soluble in water. They cannot be hydrolyzed into simple sugars. Except one carbon, all other carbon atoms in a monosaccharide have hydroxyl group (OH). The carbon without OH group has carbonyl carbon. It forms aldehyde or ketone group. The sugars with aldehyde groups are called aldo-sugar and with the sugar with kern groups are called keto-sugars. The example of aldo sugar is glucose and example of keto sugar is fructose. parts around asymmetric carbon. Asymmetric carbon is attached four different types of covalent partners. For example, glucose and galactose different in arrangement of parts around one asymmetric carbon (carbon no. 3). In aqueous solutions, most monosaccharides form rings. down during cellular respiration to release energy. During respiration many smaller monosaccharides are produced. 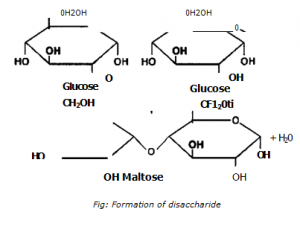 These smaller monosaccharides like glyceraldehyde, dihydroxy acetone phosphate acts as precursor for the synthesis of many, new compounds like amino acids, fatty acids. (glyceraldehydes) and ketones (dihydroxyacetone). These are . produced as intermediate compounds during respiration and photosynthesis. (b) Tetroses: They have four carbons. Tetroses are rare in nature. They occur in some bacteria. (c) Pentoses: They have five carbons. Ribose sugar is a common pentose. It is an aldo sugar. It gives five cornered ring structure in solution form. This ring is called ribofuranose. It is present in ribonucleic acids RNA. Deoxyribose is also a pentose sugar. It is found in DNA. Their general formula is C1 21122011. These are less sweet in taste. These are ess soluble in NY ater. They yield 2 monosaccharides on hydrolysis. 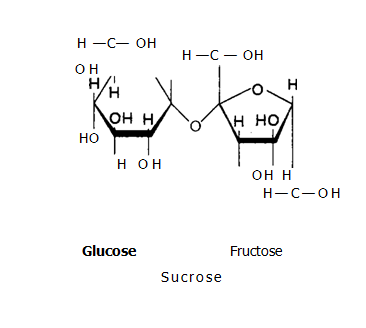 (a) Sucrose (table sugar): It is a disaccharide formed by linking a molecule of glucose to a molecule of fructose. 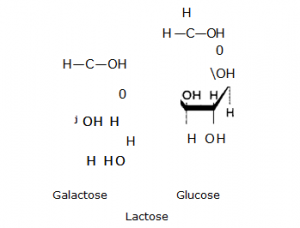 (b) Lactose: A glucose molecule bonds to another monosaccharide, galactose and it forms disaccharide lactose (commonly called milk sugar). 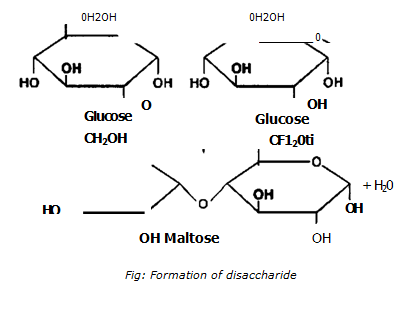 (c) Maltose: It is formed by the joining of glucose subunits. It gives beer seeds a sweet taste. Beer brewers ferment barley into alcohol. I. In polysaccharide, few hundred to a few thousand monosaccharides are linked together. 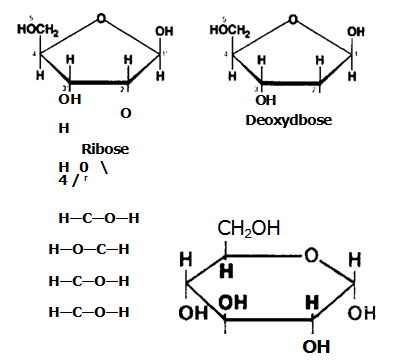 Several monosaccharides linked by glycosidic linkage and form polysaccharides. They are tasteless and sparingly soluble in water. They are most abundant in nature. They are usually branched or unbranched. Some polysaccharides like starch acts as storage material. Some polysaccharides like chitin, cellulose acts as building material. Some biologically important polysaccharides are starch, glycogen, cellulose, dextrin. agar, pectin, and chitin. (a) Amylose starch: It is a simple form of starch. Amylose have unbranched chain of glucose. It is soluble in hot water. 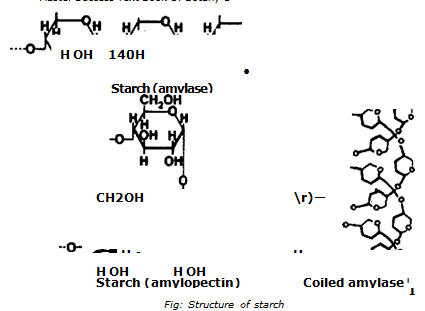 (b) Amylopectin: It is most complex form of starch. It has branched chains. It is insoluble in hot or cold water. Glycogen is a polymer of glucose. It is more extensively branched than the amylopectin of plants. It is also called animal starch. It is a chief storage compound of animals. It is found in liver and muscles. 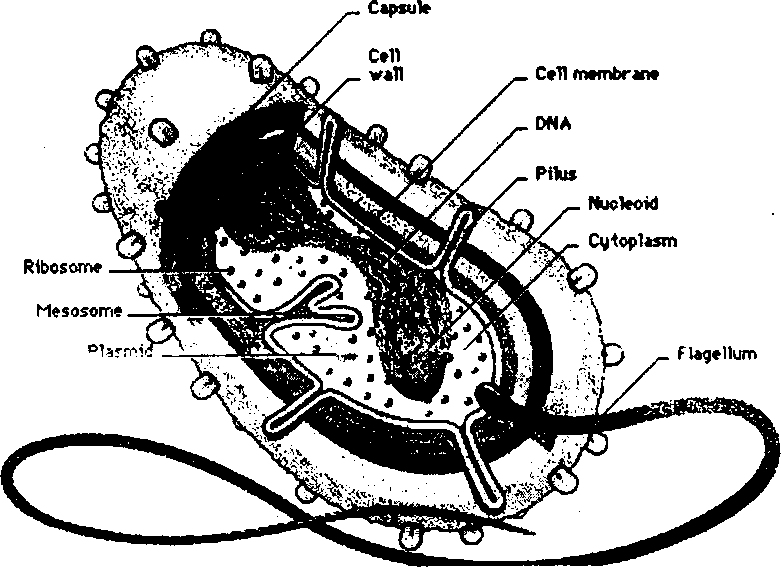 It is also found in all animal cells. It is insoluble in water. It gives red colour with iodine. It gives glucose on hydrolysis. It is the most abundant carbohydrate in nature. Cellulose is also a polymer of glucose. 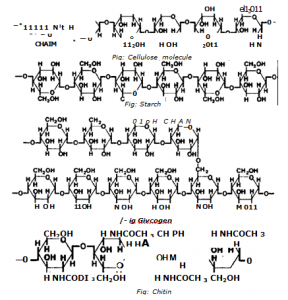 But its glycosidic linkages are different from the starch. 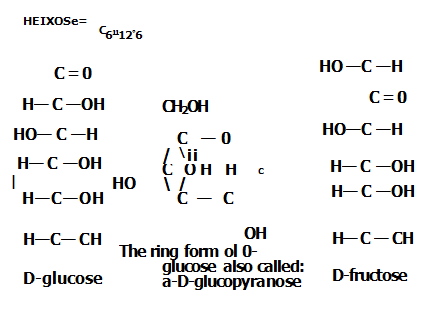 The glucose molecules of cellulose are in p configuration. The molecules of glucose in starch are held by hydrogen bonding to form microtibrils. Several intertwined microfibrils molecules form a cellulose fibril. Cellulose is the main constituents of cell walls of plants. Cotton is pure form of cellulose. It is insoluble in water. It yields glucose molecules on hydrolysis. Cellulose gives no colour with iodine. The enzyme for starch digestion acts only on a bond. It cannot act on p glycosidic bond. Therefore, this enzyme cannot digest cellulose. Some bacteria and other microorganisms live in the intestine of herbivores. They produce cellulose enzyme. Cellulase can break p glycosidic bond and digest it. amino sugars in its molecules.